What a difference a week can make in the world of football. There was a fair amount of doom and gloom lingering after Rovers’ 3-0 defeat at Port Vale but the weekend’s 2-0 victory over Fleetwood had the Keepmoat Stadium bouncing again. Whatever passion and determination lacking in the Potteries last week, was back in abundance – and an excellent attacking display reaped a duly deserved three points. Every Doncaster player put a solid shift in, with James Coppinger and Andy Williams particular stand-outs in the final third. Coppinger got the vital touch on Aaron Taylor-Sinclair’s powerful free-kick to give the hosts a 16th minute lead, which set the precedent of how the majority of the first half went. The long-serving midfielder also played a pivotal role in the second, spraying the ball in from the right and into the feet of Williams who showed great selflessness in picking out Curtis Main rather than going alone. 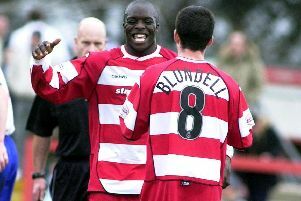 The goal was a welcome end to Main’s baron spell in a Rovers jersey, with the 23-year-old having not netted in 15 games. And Williams continually caused the Fleetwood backline plenty of problems throughout the entire match, particularly when he had the chance to run at them. If the duo can keep churning out performances like Saturday’s, then Rovers should rapidly start adding to the goals-for column, which had stood at just one before this meeting. Williams looked determined from the off and had a good sight of goal after just three minutes, but Chris Maxwell raced out of the visitors’ goal to make a vital block. Had Fleetwood managed to pinch a goal in the opening ten minutes, the afternoon’s story could have taken an entirely different course. Their best chance of the half came on seven minutes when a short corner between Lyle Della-Verde and Antoni Sarcevic caught the Doncaster defence napping but Jamie Proctor could not take full advantage as he flicked his header over the bar. Buoyed by that let-off, Rovers set about putting Fleetwood under pressure and Main did well to win a free-kick over on the right wing. Taylor-Sinclair fired a powerful cross into the box and Coppinger showed great determination to get a vital touch which carried the ball home. All that great work could quite easily have been undone out by a moment of carelessness when Thorsten Stuckmann took his eye off the ball and fumbled to a Fleetwood attacker. Luckily Taylor Sinclair was in a great position to put in a block. The tricky Williams was stretching the Fleetwood backline at any opportunity and forced Stephen Jordan into a clinical shirt pull as he was released down the right. Despite Williams’ and the majority of the Keepmoat calling for a red card, referee Trevor Kettle pointed out the covering defender and issued just a yellow, which was probably the right decision. A well-worked team effort then secured the crucial two-goal advantage on 24 minutes. Coppinger played the ball in from the right wing to Williams, who then fed in Main who was in a better position and the former Middlesbrough forward duly swept the ball home. Coppinger reflected: “I just had a feeling before the game that we’d do well. We had a massive talk within the squad in the week and you could tell within the squad, everyone was determined to do well and I think it showed. “We were a bit panicky in the end because we hadn’t been in the position yet this season and everybody wanted to win the game but I thought we were so good and worked so hard. Rovers saw out the half without conceding although Stuckmann had to produce a fine save to deny Sarcevic’s free kick from the edge of the box just after the interval. Fleetwood continued to ask the hosts questions and Della-Verde had their fans bouncing behind the goal after he found the net, but much to the home fan’s delight, it was the side netting. Graham Alexander threw on Jamille Matt in the hope of posing the hosts a different threat, but it was to no avail. In fact Williams could have finished the contest off once and for all in the 70th minute as he weaved around two challenges in the box before picking out his spot in the corner, but Maxwell got down well to turn the ball around the post. There was a sour note late on when Conor McLaughlin could easily have been dismissed by the referee. After fouling Williams, he petulantly kicked out at the forward but a very lenient Mr. Kettle again only issued a yellow. With time almost up, Alexander’s side almost pinched a consolation when substitute Declan McManus latched onto Matt’s cross, but Stuckmann blocked well with his knees to preserve a third clean sheet of the campaign. ROVERS: Stuckmann 7, Lund 7, MacKenzie 7, Butler 7, Taylor-Sinclair 7, Coppinger 8, Middleton 7, Chaplow 7, Evina 7, Williams 8, Main 7 (Stewart 68 7). SUBS: Marosi, Mandeville, McKay, Whitehouse, Carberry, Linley. FLEETWOOD: Maxwell 6, McLaughlin 5, Jordan 6 (Grant 71, 5), Andrew 6, Hornby-Forbes 6 (McManus 85, 5), Della-Verde 7, Sarcevic 7, Ryan 6, Bell 6, Proctor 6, Ball 5 (Matt 61, 5). SUBS: Nirrenold, McManus, Cartwright, Sowerby, Arestidou.